Our objective: To accelerate the development of a global hydrogen market by identifying and overcoming key technology barriers to the production, distribution, storage, and use of hydrogen at gigawatt scale. IC8 was launched at the third Mission Innovation Ministerial to address the need for further technology improvements to enable hydrogen to be cost-competitive in the energy system. IC8 participants met in Berlin, Germany in October 2018 for a deep dive workshop involving industry, government and academics. Hydrogen is a promising energy-dense (mass density) energy carrier with multiple uses and the potential to play an essential part in achieving deep cuts in emissions and improved security and resilience of the global energy system at scale. Pure hydrogen is made from splitting hydrogen-rich substances. To date the approach to hydrogen production has centred on fossil fuels, such as natural gas or coal. In the future, producing hydrogen from renewable energy and water has potential to deliver large volumes of hydrogen for multiple uses at low cost. Creating the supply chain for hydrogen will be equally important. Governments are recognising the potential of hydrogen and are beginning to set policy goals for hydrogen usage, particularly in relation to mature end-use applications like automotive fuel cells. 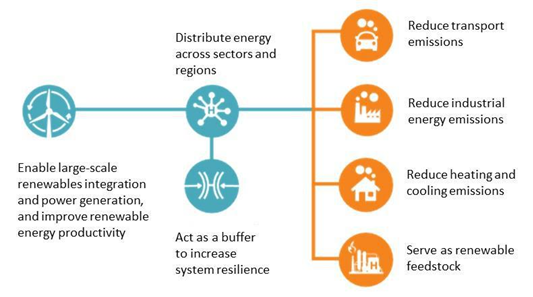 For these policies to succeed and for hydrogen to achieve its full potential, further technology improvements as well as mass market volumes are needed along the hydrogen value chain to make hydrogen cost-competitive in the broader energy system. Further, if hydrogen is to become an internationally traded commodity, similar to LNG, then a range of technical factors must be addressed. Members will collaborate to identify and accelerate key breakthroughs needed to achieve a cost-competitive hydrogen value chain. Innovation Challenge 8 will provide a platform to understand and progress selected issues around how a global hydrogen market would function as a system (particularly where these issues are not being actively contemplated in other forums). Hydrogen can play multiple roles in energy transitions. Hydrogen provides a means of long-term energy storage, and assists with large-scale integration of renewable electricity into the energy system. It allows for the distribution of energy across regions and seasons and can serve as a buffer to increase energy-system resilience. Hydrogen can be produced and stored at times of low demand (curtailed renewable energy) then utilized (e.g. via re-conversion into electricity) when needed, thereby enhancing the energy productivity of renewable sources. Today’s transportation sector depends almost entirely on fossil fuels and creates more than 20 percent of all CO2 emissions as well as other harmful pollutants. Hydrogen fuel cell vehicles, with their high performance and the convenience offered by fast refuelling times, can complement battery electric vehicles to achieve a broad decarbonisation of transport segments, improving air quality and reducing pollution. In heavy industry, hydrogen can help reduce emissions from processes that are hard to electrify, in particular those requiring high-grade heat, such as chemicals, petrochemicals, and refining; cement; iron and steel. Hydrogen can also be used in cogeneration units to generate heat and power for industrial uses. In regions with existing natural-gas networks, hydrogen can make use of existing infrastructure and provide a cost-effective means to replace or augment natural gas consumption. Current uses of hydrogen as industry feedstock—amounting to more than 55 million tons per year— could be fully decarbonized. Hydrogen could also be employed to produce cleaner chemicals and fertilizers and steel, by being used as a chemical feedstock in combination with captured carbon and by being used as a reducing agent for iron ore. The Hydrogen Council has estimated that hydrogen could account for almost one fifth of total final energy consumed by 2050. The Hydrogen Council estimates this could reduce annual CO2 emissions by roughly 6 Gt compared to today’s technologies, and contribute roughly 20 per cent of the additional abatement required to limit global warming to two degrees Celsius (above and beyond already agreed commitments). It would also eliminate local emissions such as sulphur oxides, nitrogen oxides, and particulates linked to smog formation; and help reduce noise pollution in cities. In addition the Hydrogen Council estimated potential for US$2.5 trillion in revenue and 30 million jobs world-wide as a result of deploying hydrogen technology across sectors. The challenge will focus multinational research and large scale demonstration efforts from both public and private sectors on industry-directed breakthroughs which have a realistic prospect of underpinning commercial renewable and clean hydrogen industries (and implied target prices) within the next 5 years. Activity will be organised into four streams: making hydrogen, sharing hydrogen, using hydrogen and cross-cutting issues. Innovation Challenge 8 will explore opportunities to collaborate with Innovation Challenges 3, 4 and 5, where collaboration can add value. 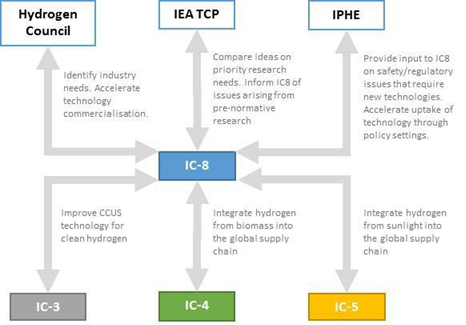 Additionally, IC-8 will collaborate with existing international co-operation forums including: the International Partnership for Hydrogen and Fuel Cells in the Economy (IPHE), the IEA Technology Collaboration Programmes (IEA TCPs), the Hydrogen Council, and other regional and national bodies.